I’m a textbook discarder. Anytime my husband brings something into the house, I’m on my way through a different door hauling something out. I’m all about clean lines, order, and lists. Lots and lots of lists. The Story of My Life. Literally. Giving away unnecessary stuff makes me feel good, and a lack of clutter equals a lack of complication in some kind of metaphysical, big life meaning thingy that I haven’t quite figured out. Ironically though, the only thing I won’t let go of is memories. Not the painful ones that wake you up in the middle of the night with a big, fat “why?” staring down from the ceiling. Those conveniently go out with the trash as soon as I can gather them up. I’m talking about the good ones. The real, sometimes raw, but more often relevant things from the past that have made a big contribution to my present. I have every high school note, my letters from college, cards given back and forth for special events…all of it. It’s a treasure trove of boyfriends, break-ups, and besties that I can’t live without. But thanks to the worldwide web and the ghost of Steve Jobs, collecting memories is harder today than it used to be. We email instead of pulling out paper and pen, and thank you notes have almost become a thing of the past because it’s so much easier to text a quick line or two instead. Just like that, some of our best memories are deleted instead of being filed away for a rainy day. Life is busy, and even though any kind of connection counts, there’s nothing like opening the mailbox expecting bills and finding a letter from a friend. So the task for Days 6 and 7 is to write a letter, because it’s a foolproof way to make someone you care about smile. Even though it takes more time than an email or a text, the reward is well worth the investment. All the way around. So who are you going to write this weekend? We’re all writing to Aunt Mid, who at 96 has thrown in the towel for her annual holiday trip from Nebraska to Colorado. She’s an amazing woman, and hopefully our letters will help make her Christmas a little more shiny and bright. 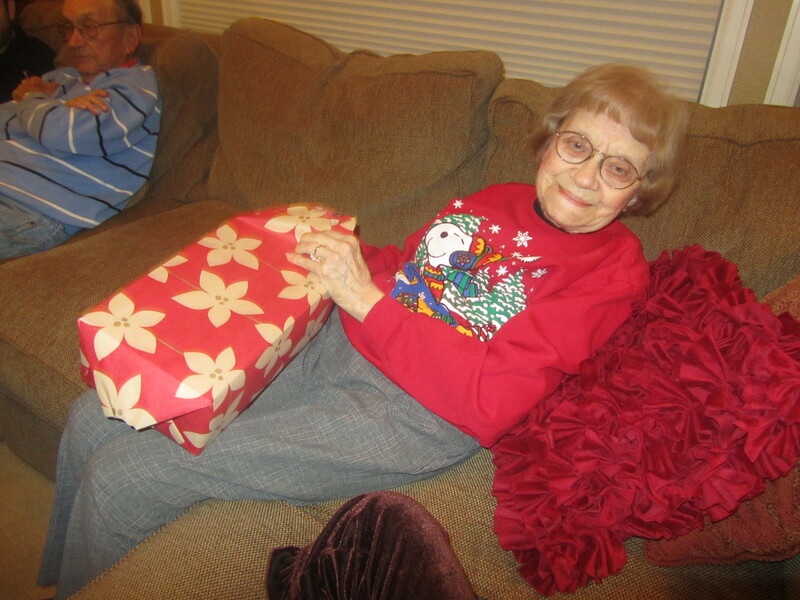 Aunt Mid at the tender age of 94. I love physical letters/cards – I’m old fashioned that way. But honestly, I don’t remember the last time I actually wrote a letter (I’ll write two lines on a card, yes). Let me get on that right away – maybe one to Aunt Mid! 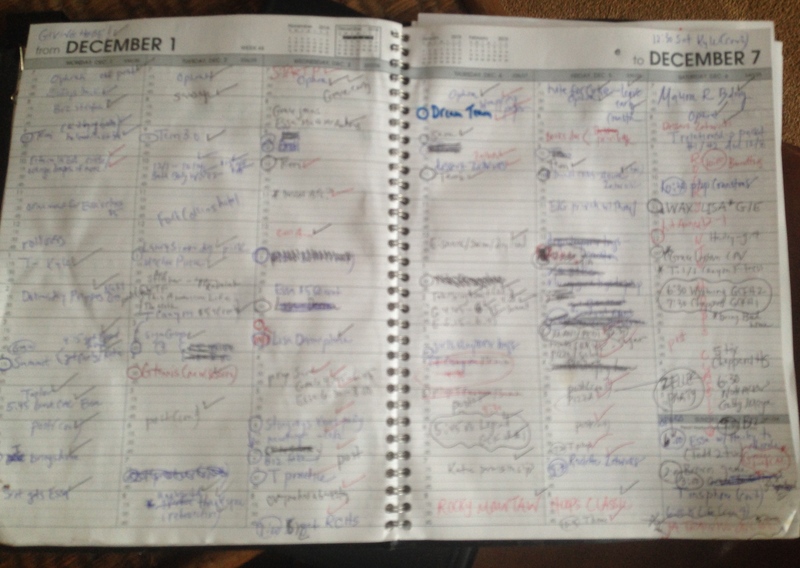 And glad to see that the Nutcracker is in your planner. 🙂 See you tonight. Gabi’s excited to see Grace. (And oh btw, remind me to tell you a story tonight, along the lines of memories — not for public consumption). you are definitely in the lead! So true. I love stumbling upon a note or card from the past that makes smile.. Words in black and white are so much more meaningful. Challenge accepted! Suzette and I can tie, but I won’t allow her to beat me. Hi Suzette! I love to write letters. Just wrote one two days ago, but what’s a couple more. 🙂 It definitely is a lost art and I am trying to bring it back with my card business. People don’t send cards much these days either. Great post today. 🙂 Have a lovely weekend. Thank you for taking the time to read, comment…and write! Definitely something about the physical writing thing. I am drawing to the close of a Creative Writing course, and part of the homework is to physically write in a notebook every day. Not journalling, but a “piece” every day. Anyway, point being I’ve rediscovered my love of writing with a real fountain pen on real paper. That’s a great excercise. Definitely gets you into a habit whuch leads to better writing. Good luck with your notebook and thanks for the visit and comment! You know, you are SO right. This inspires me to do the same. I have so much lovely stationary. I will write a letter or three, and send them out. I am not sending out Christmas cards this year. So, I will reach out to a few loved ones in a more personal way. Thanks for this, and the last few posts. Love them. Missed your presence and glad you are back to writing! Thanks so much for taking the time to read and comment, Lisa. I really appreciate it! I’ve always had a secret dream of owning an awesome stationary store, but, sadly, you would probably be my only customer. We just wrote our letters today. I think the hardest thing to do is the act of putting pen in hand. Once we all got started, they flowed pretty quickly. I know your friends and relatives will love getting your letters. That’s a great idea Stacie. I’m a saver of memories too, but also of everything else. Wish you could swing by and help me clear out some of this stuff. I agree with this post whole-heartedly. 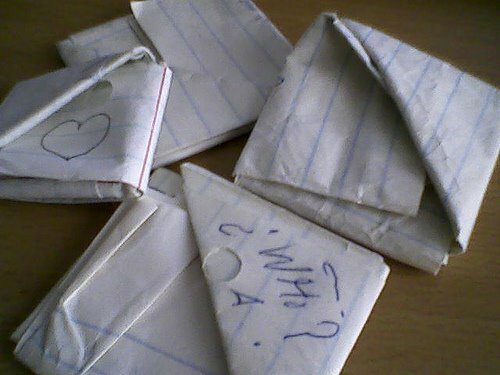 I wonder how many of those perfectly folded so we will know if the person just passing the note tried to read it notes were from me. Miss you. Does writing xmas cards count? I hope so – it’s the only way I’ll be able to manage this one! Everything counts! Thanks for taking the time to read, catch up, comment, and do good!